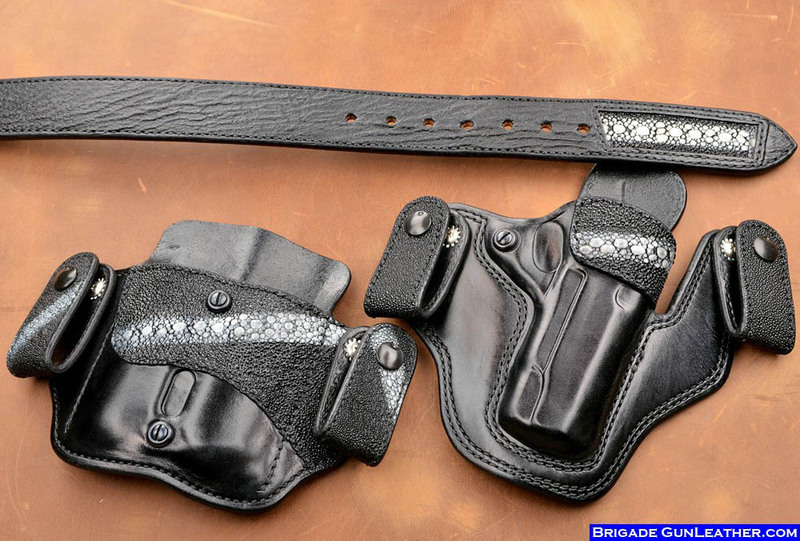 Brigade Custom Holsters and leather holsters accessories. I specialize in custom holsters and leather gun holsters, western holsters and concealed carry holsters. My custom holsters are made from top grade leather superbly crafted to produce the finest leather holsters & holster accessories. 19 years of Building Fine Leather Gun Holsters. 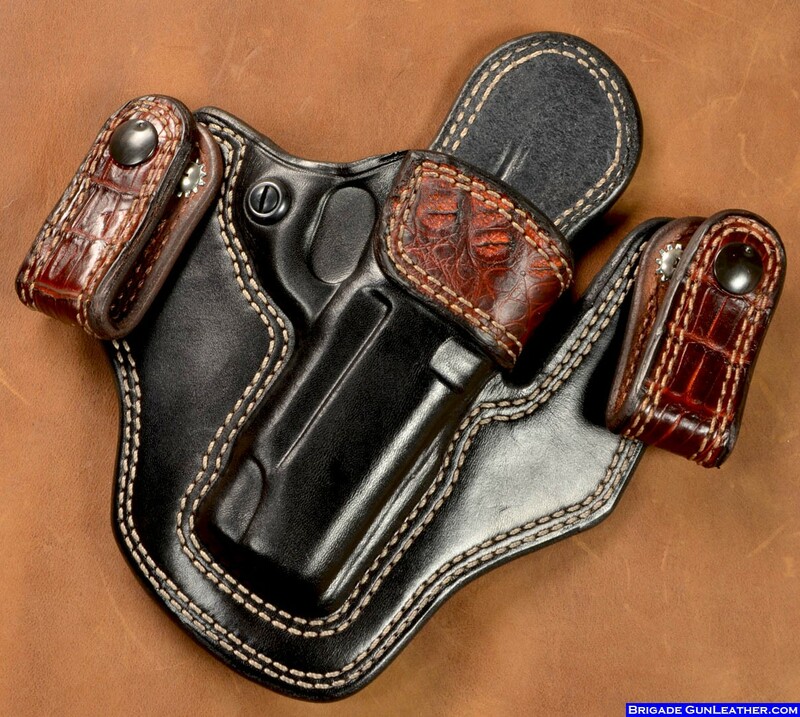 My custom holsters are built for many types of guns and are finely crafted with top American leather hides and experienced craftsmanship to produce the best fitting quality leather gun holsters . Please contact me for any of your leather holsters needs. Please call if you don't see your handgun listed for the holster you are looking for. 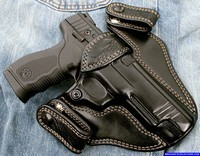 Not all of my leather holsters and gun models are featured on my website. 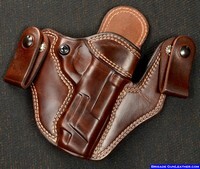 Scroll Below to see new leather custom holsters & photos. New to concealed carry holsters? Come visit the concealed carry holster information page to help decide which custom holster will fit your needs for daily concealed carry. 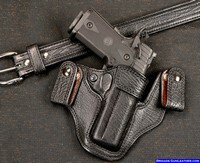 I offer leather holsters for inside the waist band carry and outside waistband carry. 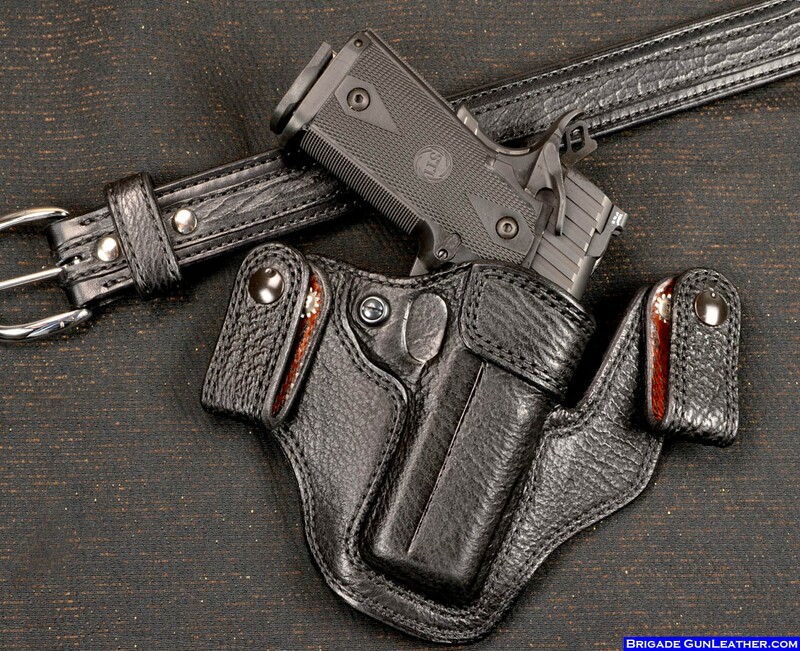 Choosing the right gun holsters are necessary for successful concealed carry. 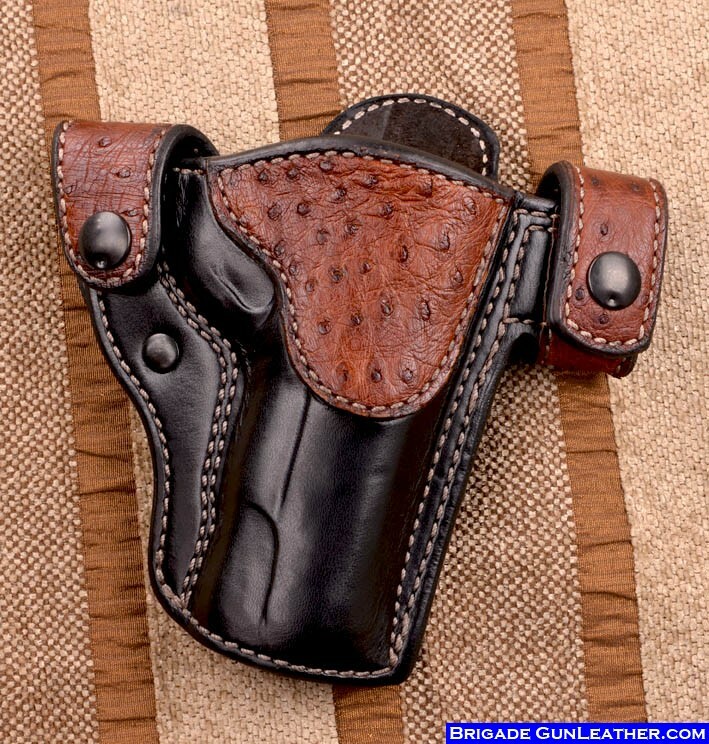 Please always feel free to call with any question you may have in choosing the right leather holster. I enjoy speaking with customers about custom leather. 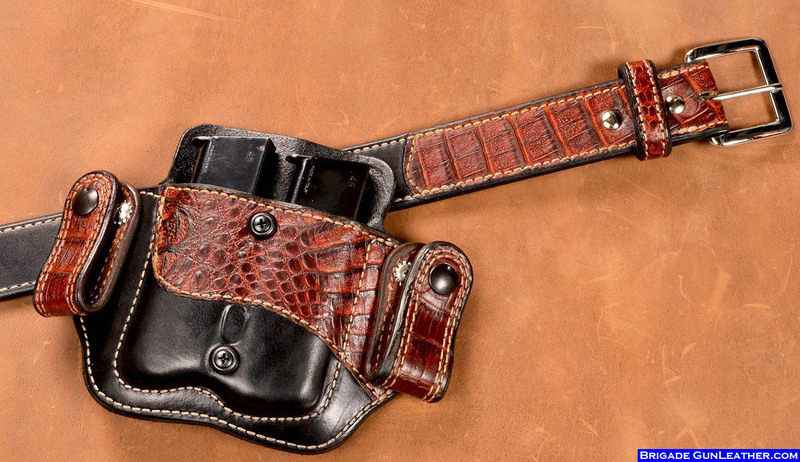 I have been building custom holsters and leaher holsters for over 19 years and so much experience has contributed to perfected leather holster designs using old world craftsmanship. 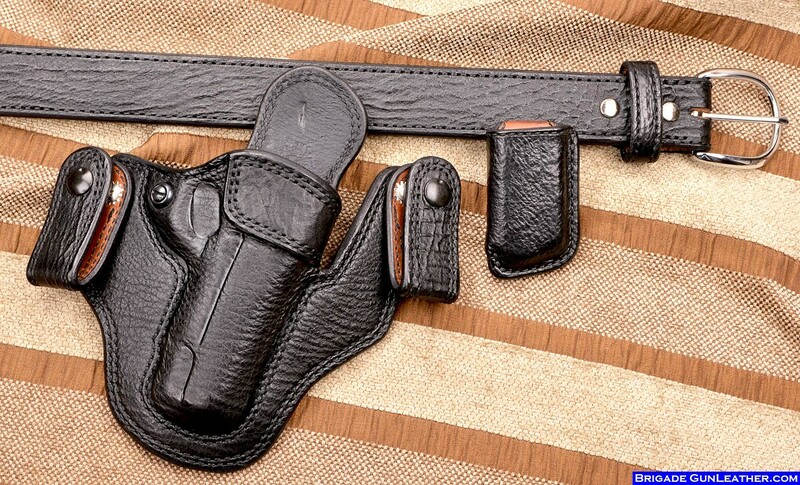 A good concealed carry leather holster is the best choice when it comes to protecting your weapon against a possible gun grab. A good fitting holster is both comfortable and offers the best concealment possible. I build custom holsters for hundreds of pistols including Glock, Sig Sauer, Smith & Wesson, Kimber, Colt, Springfield, Taurus, Heckler and Koch, and so many more guns. Please call if you don't find your gun model. My concealed carry gun holsters are completely handmade with the utmost care to last you for years and years. Each leather hide we buy is selected for top quality, the best for gun holsters, belts and western gun holsters. The stitching in our leather holsters is of the highest quality thread, stitched with the finest sewing machines available. Every start and stop point is double lock-stitched for added strength and durability. 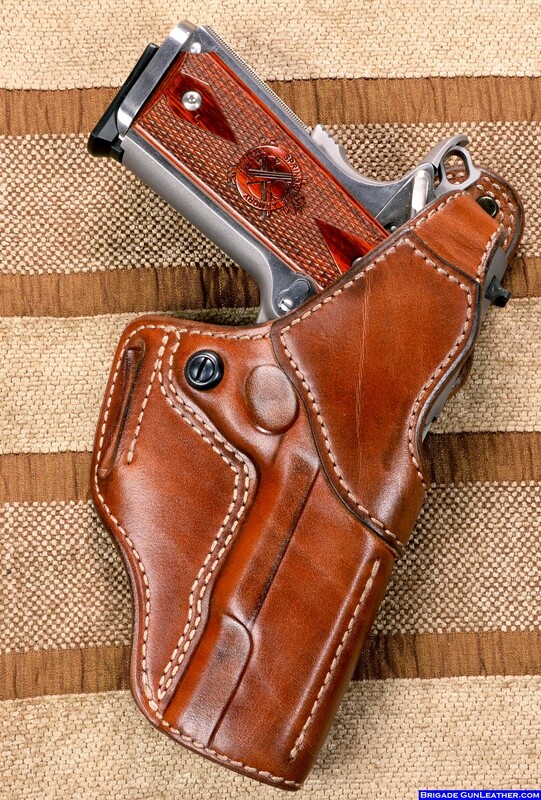 Every gun holster, including our western gun holsters, are hand molded around an exact replica gun to get a firm and precise locking fit for the specific gun it's made for. The edges of my custom holsters and belts are rounded, burnished, then edge dressed. 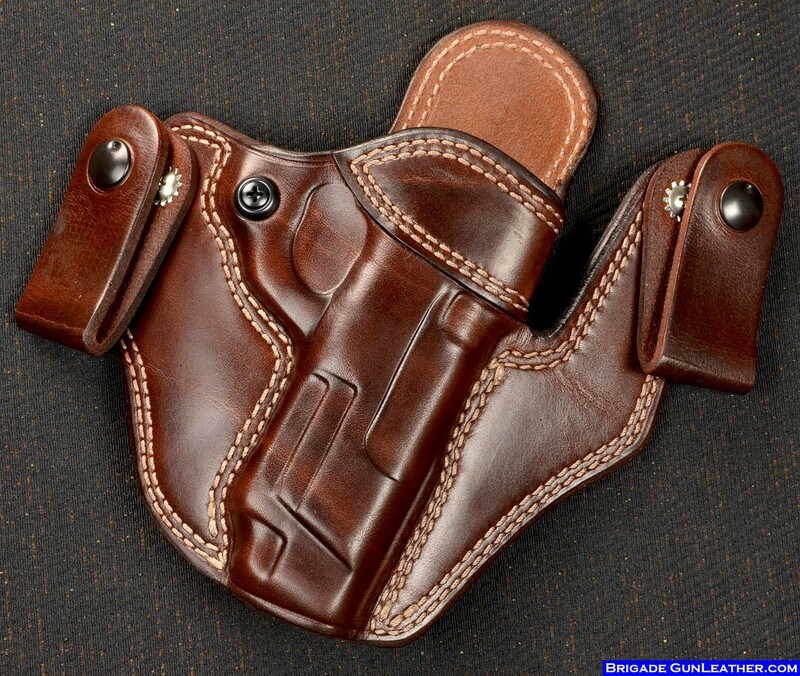 All of the holsters, western gun holsters and leather belts have just the right amount of oil and wax to keep from drying. Many coats of wax and oil are done by hand to ensure a life time of use. I start with American leather hides and I build all of my gun holsters and belts as if they were my own. 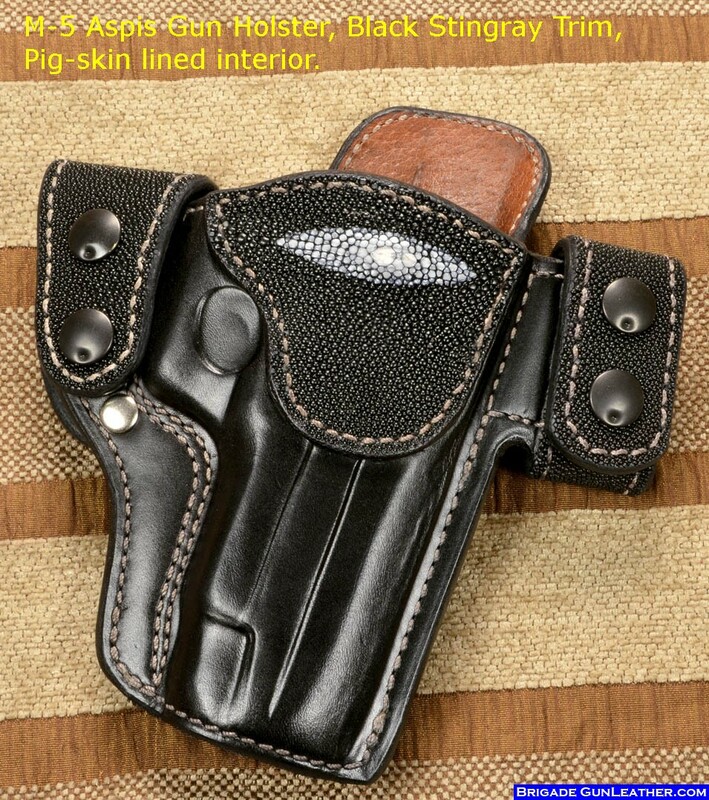 My leather lined gun holsters feature a resin-bonded suede lining that's smooth and soft on your gun’s finish. 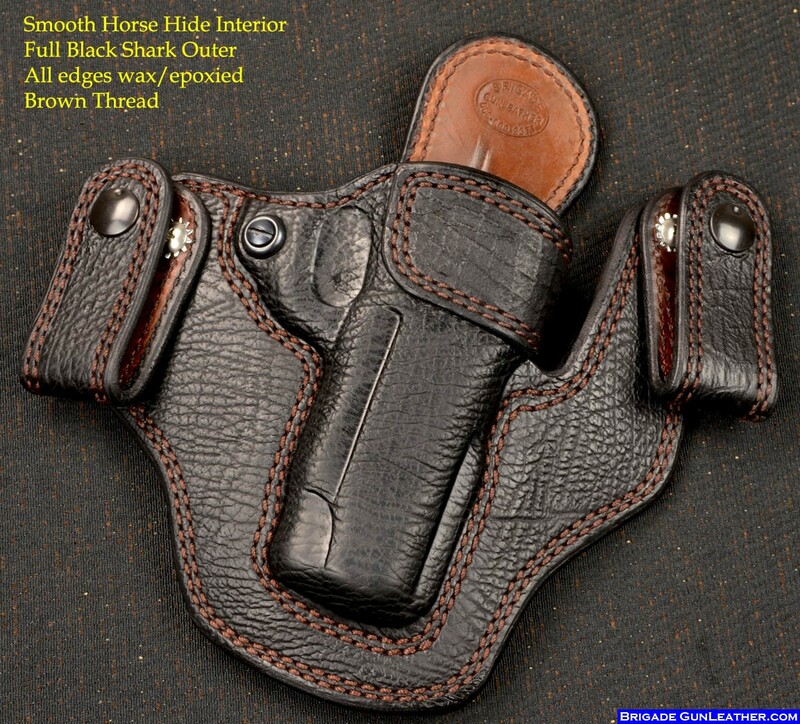 My unlined leather holsters are silicone-teflon impregnated and waxed and then buffed for a smooth interior. 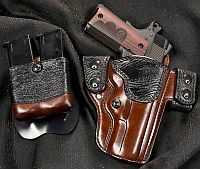 This is a process I have created with much success to keep your pistol protected from the interior of the holster, meaning the inside of the leather holster is smooth and not rough like less quality holsters and plastics. 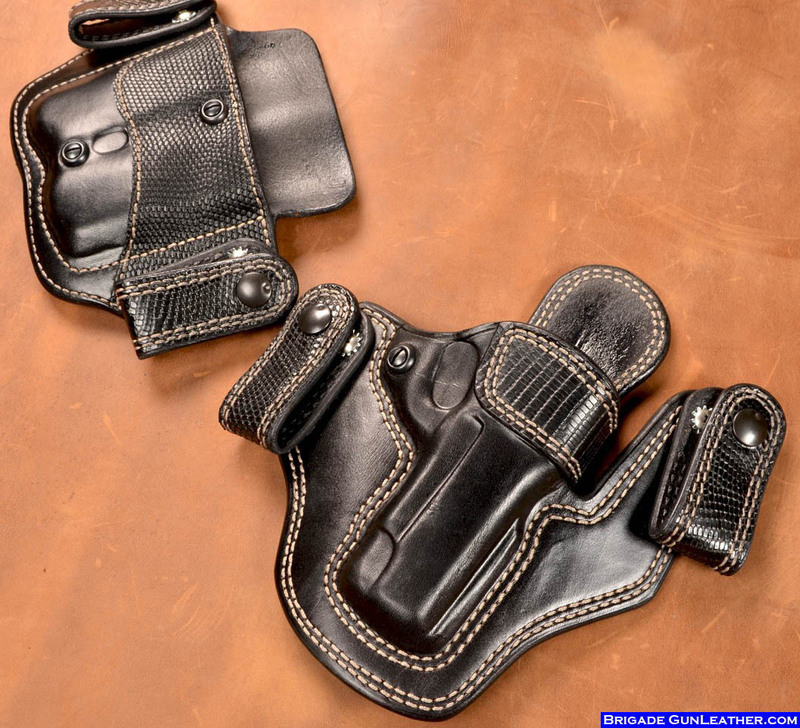 Each leather holster, gun belt, and western holsters are hand finished with the finest oils and dyes then waxed to a beautiful finish and buffed under heat to bring out a beautiful leather depth and finish to your custom leather holsters. Recently finished custom M-5 Aspis holster and belt. 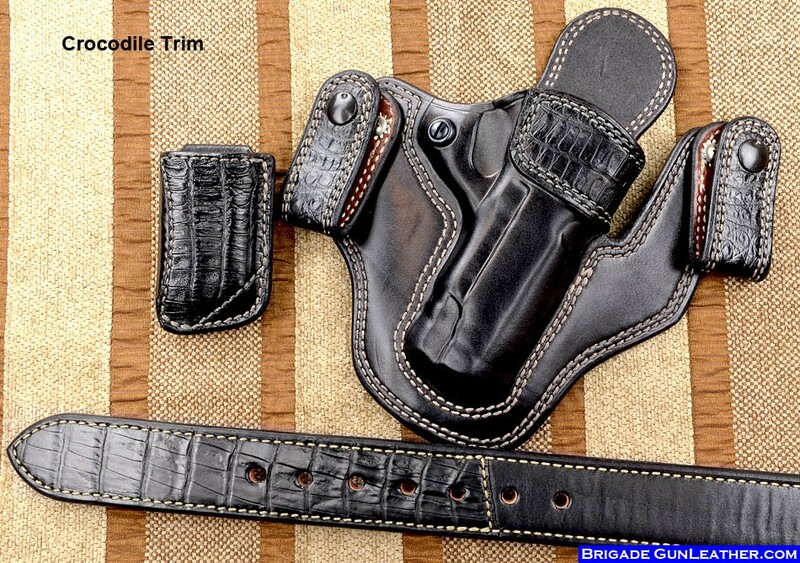 Cordovan brown leather with black Crocodile skin for an HK pistol. 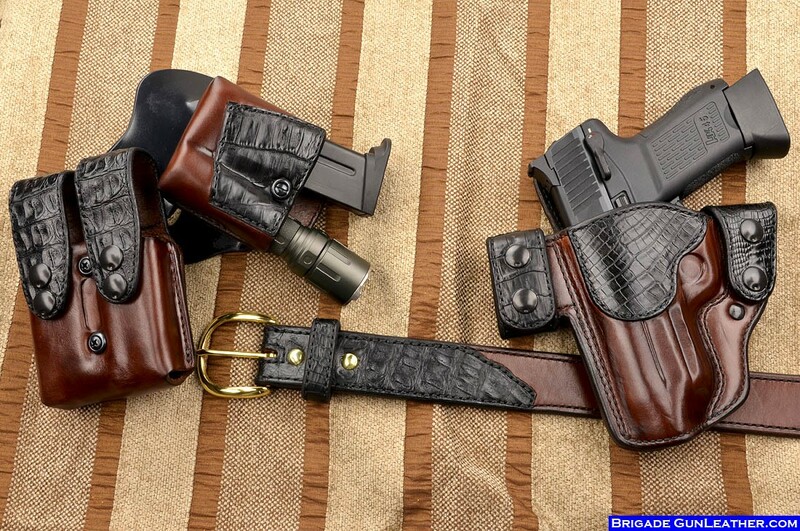 Custom M-11 exotic Shark skin holsters and belt and magazine pouch for a 1911 pistol. 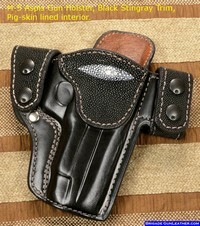 Custom leather gun holster for a 4.25" 1911 pistol. Black leather and Black Stingray hide. 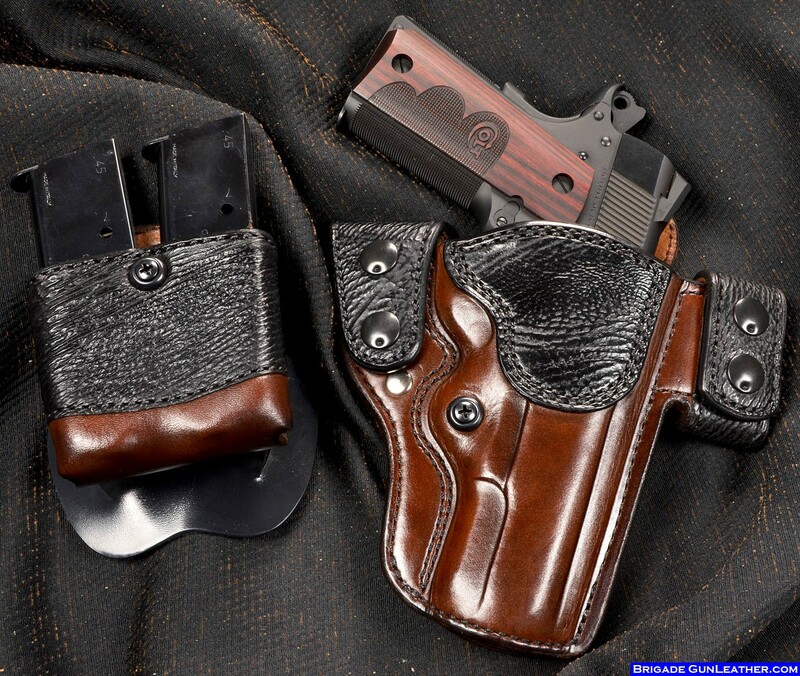 An example of a 1911 M-11 Exotic custom holster and mag pouch and belt. Black leather, white thread and Black Crocodile trim. Full Shark Hide 1911 Gun Holster for a Kimber 4" 1911 Pistol, brown thread built using horsehide for the main leather. 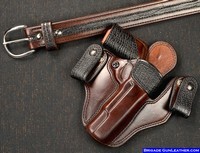 Custom IWB Gun Holster with exotic Shark Trim with matching gun belt for a 1911 pistol. Custom Holster for a Smith Wesson MP Pistol Brown holster antique white thread. Brigade GunLeather Facebook page and Youtube channel coming soon!